Most of my wood is from local gardens & farms. It comes freshly felled and in the round. Many people in the community know I am a woodturner and in exchange for a bowl or other item would rather see their timber recycled than go on the log pile for burning. The wood is brought back to my home and I like to process it quickly before it has time to dry out and split. This is particularly important in the spring and summer when the temperature starts to rise and the humidity drops. I cut the wood to the shapes I need, avoiding the centre core of the wood which is the part most likely to split (the centre core may not always be in the middle). I then rough turn the work into thick walled bowls, e.g. For a 12 in salad bowl I will make a bowl with a wall thickness of approx 1.2 in thick and core the middle for smaller items thus saving on unnecessary wood shavings. The work is dated and identified and put away to air dry. Depending on the type of wood and the season of the year I may seal the end grain to reduce the chance of it splitting. It will be stored low to the ground where it is generally cooler. After 12 months these thick walled bowls have dried sufficiently to return to the lathe. Due to the natural movement as the wood dries they will now be oval, not round and will need rechucking to get a firm hold on the lathe. There are a number of ways of doing this depending upon the size of the piece and preferred chucking method. They can then be brought back to the round with a sharp gouge and finished to a good balanced shape and if required textured and coloured on or off the lathe. Finishing is very important. It is often this stage which lets the novice turner down. 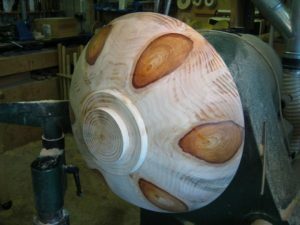 Being pleased with the shape, the bowl is taken off the lathe as quickly as possible to show partners and friends with insufficient care and attention being given to remove tooling and scratch marks. Abrasive paper is much better now than it ever used to be but it does have to be sharp. A friend of mine commented recently that you should use abrasive paper as though someone else had bought it! Go through all the grades –up to 320 grit for domestic ware- and higher for gallery pieces say 1500 grit or more. In most cases I prefer oil finishes which produce a finish in the wood not on the wood and are not high gloss. Walnut, Sunflower or Linseed oil for domestic ware and a special herb & resin oil for the rest. Remember to finish the finish.